Explanation: If Scorpius looked this good to the unaided eye, humans might remember it better. Scorpius more typically appears as a few bright stars in a well-known but rarely pointed out zodiacal constellation. To get a spectacular image like this, though, one needs a good camera, color filters, and a digital image processor. To bring out detail, the featured image not only involved long duration exposures taken in several colors, but one exposure in a very specific red color emitted by hydrogen. The resulting image shows many breathtaking features. Vertically across the image left is part of the plane of our Milky Way Galaxy. Visible there are vast clouds of bright stars and long filaments of dark dust. Jutting out diagonally from the Milky Way in the image center are dark dust bands known as the Dark River. This river connects to several bright stars on the right that are part of Scorpius' head and claws, and include the bright star Antares. Above and right of Antares is an even brighter planet: Jupiter. Numerous red emission nebulas and blue reflection nebulas are visible throughout the image. 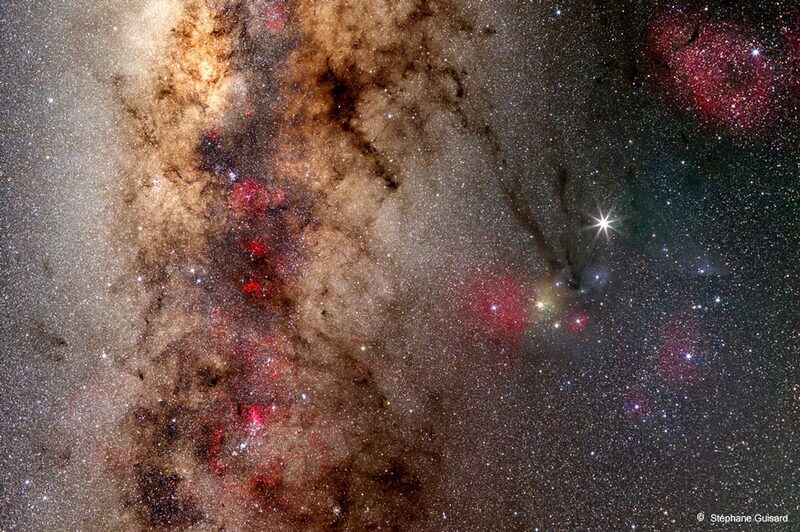 Scorpius appears prominently in southern skies after sunset during the middle of the year.